Als Julie Jacobs den Schlüssel zu einem Schließfach im italienischen Siena erbt, erfährt sie, dass es ihr ein Familiengeheimnis offenbaren wird. Bald darauf ist sie der wahren Lebensgeschichte ihrer Ahnin Giulietta auf der Spur - die Frau, die Shakespeare zu seinem Drama "Romeo und Julia" inspirierte. Als Julie die Nachkommen der beiden Familie kennenlernt, deren Fehde Siena einst auf den Kopf stellte, erkennt sie, dass der Fluch "Plague on both your houses!" noch nicht der Vergangenheit angehört. Anne Fortier grew up in Denmark and emigrated to the United States in 2002 to work in film. She holds a Ph.D. in the history of ideas from Aarhus University, Denmark. 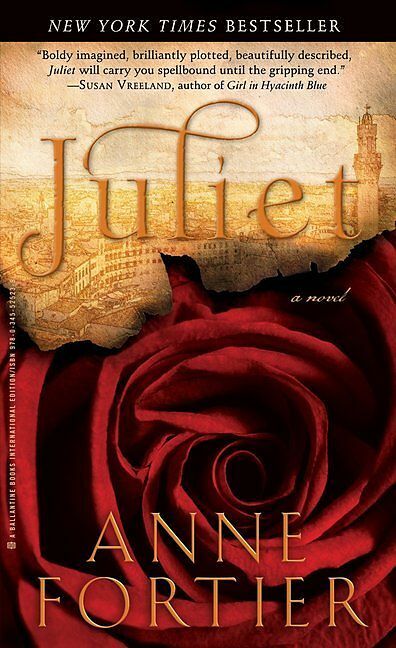 The story of Juliet was inspired by Anne Fortier’s mother, who always considered Verona her true home . . . until she discovered Siena. “But they give me heartburn!” the boy had complained, with all the accusatory anxiety of a fourteen-year-old. Umberto’s eyes narrowed as they always did when my twin sister was mentioned. “What do you think?” Only then, up close, did I see that he looked bruised and bitter, as if he had spent the last few nights drinking himself to sleep. But perhaps it had been a natural thing to do. Without Aunt Rose what would become of Umberto? For as long as I could remember, the two of them had been yoked together in a necessary partnership of money and muscle—she had played the withering belle, he the patient butler—and despite their differences, clearly neither of them had ever been willing to attempt life without the other. The Lincoln was parked discreetly over by the fire pit, and no one saw Umberto placing my old pack in the trunk before opening the back door for me with measured ceremony. But it had never been Aunt Rose who insisted on the formality. Although Umberto was her employee, she had always treated him like family. The gesture, however, was never returned. Whenever Aunt Rose would invite Umberto to join us at the dinner table, he would merely look at her with bemused forbearance, as if it was an ongoing wonder to him why she kept asking and just somehow didn’t get it. He ate all his meals in the kitchen, always had, always would, and not even the name of sweet Jesus—spoken in rising exasperation—could persuade him to come and sit down with us, even at Thanksgiving. Aunt Rose used to dismiss Umberto’s peculiarity as a European thing and smoothly segue into a lecture about tyranny, liberty, and independence that would inevitably culminate in her pointing a fork at us and snorting, “and that is why we are not going to Europe on vacation. Especially Italy. End of story.” Personally, I was fairly certain that Umberto preferred to eat alone simply because he considered his own company vastly superior to what we had to offer. There he was, serene in the kitchen, with his opera, his wine, and his perfectly ripened block of Parmesan cheese, while we—Aunt Rose, me, and Janice—bickered and shivered in the drafty dining room. Given the option, I would have lived every minute of every day in the kitchen, too. As we drove through the dark Shenandoah Valley that night, Umberto told me about Aunt Rose’s last hours. She had died peacefully, in her sleep, after an evening of listening to all her favorite Fred Astaire songs, one crackling record after another. Once the last chord of the last piece had died out, she had stood up and opened the French doors to the garden outside, perhaps wanting to breathe in the honeysuckle one more time. As she stood there, eyes closed, Umberto told me, the long lace curtains had fluttered round her spindly body without a sound, as if she was already a ghost. “Did I do the right thing?” she had asked, quietly. “Of course you did,” had been his diplomatic answer. it was midnight by the time we rolled into Aunt Rose’s driveway. Umberto had already warned me that Janice had arrived from Florida that afternoon with a calculator and a bottle of champagne. That did not, however, explain the second jock-mobile parked right in front of the entrance. “I sincerely hope,” I said, taking my pack out of the trunk before Umberto could get to it, “that is not the undertaker.” No sooner had I said the words than I winced at my own flippancy. It was completely unlike me to talk like that, and it only ever happened when I came within earshot of my sister. As soon as we stepped through the front door of the house, I saw what he meant. All the large portraits in the hallway had been taken down and were now standing with their backs to the wall like delinquents before a firing squad. And the Venetian vase that had always stood on the round table beneath the chandelier was already gone. My voice echoed through the quiet house, but as soon as the noise died down I heard running feet in the corridor upstairs. Yet despite her guilty rush, Janice had to make her usual slow-motion appearance on the broad staircase, her flimsy summer dress emphasizing her sumptuous curves far better than had she worn nothing at all. Pausing for the world press, she tossed back her long hair with languid self-satisfaction and sent me a supercilious smile before commencing her descent. “Lo and behold,” she observed, her voice sweetly chilled, “the virgitarian has landed.” Only then did I notice the male flavor-of-the-week trailing right behind her, looking as disheveled and bloodshot as one does after time alone with my sister. Janice shot me an icy glare, but quickly checked herself. She knew very well that I could not care less about her good opinion, and that her anger just amused me. I was born four minutes before her. No matter what she did, or said, I would always be four minutes older. Even if—in Janice’s own mind—she was the hypersonic hare and I the plodding turtle, we both knew she could run cocky circles around me all she liked, but that she would never actually catch up and close that tiny gap between us. Once we caught up with Janice, she had already draped herself over Aunt Rose’s favorite armchair, a gin and tonic nestling on the foxhunt-motif cushion I had cross-stitched as a senior in high school while my sister had been out on the prowl for upright prey. It was vintage Janice to be angling for a fight over someone’s dead body, and I turned my back to her and walked over to the French doors. On the terrace outside, Aunt Rose’s beloved terra-cotta pots sat like a row of mourners, flower heads hanging beyond consolation. It was an unusual sight. Umberto always kept the garden in perfect order, but perhaps he found no pleasure in his work now that his employer and grateful audience was no more. “Do you mind?” I croaked, and for a second or two, Janice actually looked chastened. Then she shrugged it off as she always did, and reached once more for the gin bottle. I did not even bother to look at her as she feigned clumsiness, raising her perfectly groomed eyebrows in astonishment to let us know that she certainly had not intended to pour quite so much. As the sun slowly melted into the horizon, so would Janice soon melt into a chaise longue, leaving the great questions of life for others to answer as long as they kept the liquor coming. She had been like that for as long as I remembered: insatiable. When we were children, Aunt Rose used to laugh delightedly and exclaim, “That girl, she could eat her way out of a gingerbread prison,” as if Janice’s greediness was something to be proud of. But then, Aunt Rose was at the top of the food chain and had—unlike me—nothing to fear. For as long as I could remember, Janice had been able to sniff out my secret candy no matter where I hid it, and Easter mornings in our family were nasty, brutish, and short. They would inevitably climax with Umberto chastising her for stealing my share of the Easter eggs, and Janice—teeth dripping with chocolate—hissing from underneath her bed that he wasn’t her daddy and couldn’t tell her what to do. The frustrating thing was that she didn’t look her part. Her skin stubbornly refused to give away its secrets; it was as smooth as the satin icing on a wedding cake, her features as delicately crafted as the little marzipan fruits and flowers in the hands of a master confectioner. Neither gin nor coffee nor shame nor remorse had been able to crack that glazed façade; it was as if she had a perennial spring of life inside her, as if she rose every morning rejuvenated from the well of eternity, not a day older, not an ounce heavier, and still ravenously hungry for the world.